E' appena passata l'attesissima "Notte degli Oscar", la cerimonia di premiazione dei film e attori più meritevoli dell'anno 2011. È un simbolo perfetto dell'industria cinematografica: un uomo con un corpo forte e atletico che stringe in mano una grossa spada scintillante, e a cui è stata tagliata una bella fetta di testa, quella che contiene il cervello. Di seguito uno storify che raccoglie non solo i vincitori della serata divisi per categoria, ma anche le fotografie dal red carpet, tweet sull'evento e approfondimenti sui film che hanno vinto. The Oscars Night has just ended, the awards ceremony everybody waits for. 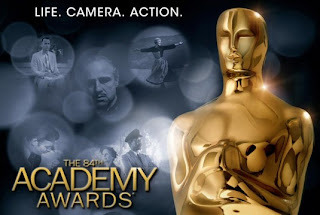 An Academy Award is an award bestowed by the American Academy of Motion Picture Arts and Sciences (AMPAS) to recognize excellence of professionals in the film industry, including directors, actors, and writers. The Oscar statuette is officially named the Academy Award of Merit and is one of nine types of Academy Awards. Made of gold-plated britannium on a black metal base, the statuette is 13.5 in (34 cm) tall, weighs 8.5 lb (3.85 kg) and depicts a knight rendered in Art Deco style holding a crusader's sword standing on a reel of film with five spokes. The five spokes each represent the original branches of the Academy: Actors, Writers, Directors, Producers, and Technicians. In support of the American effort in World War II, the statuettes were made of plaster and were traded in for gold ones after the war had ended. Unfortunately, the critical worth, artistic vision, cultural influence, and innovative qualities of many films are not given the same voting weight. Especially since the 1980s, moneymaking "formula-made" blockbusters with glossy production values have often been crowd-pleasing titans (and Best Picture winners), but they haven't necessarily been great films with depth or critical acclaim by any measure. Above you can find a storify with lots of resources, links to the winning movies, all the red carpet pictures and tweets from the event.